Location: On a shoal between Port Jefferson, NY and Bridgeport, CT. Description: 60 feet; white flash every five seconds; Victorian structure with attached tower built upon concrete-filled caisson. 1837: A 100-ton wooden lightship is stationed at Stratford Shoal. 1867: The lightship receives the designation LV15. 1873: Congress appropriates funds for a lighthouse at Stratford Shoal. 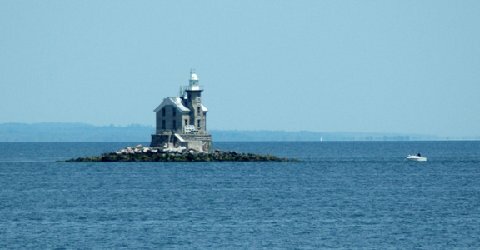 1874: The New York legislature cedes jurisdiction of "less than one acre" at Stratford Shoal to the federal government for the construction of a lighthouse. 1875, February: LV15 is driven off station by ice and comes aground near Orient Point. 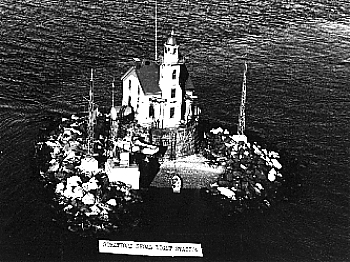 1876: The lighthouse is constructed, and the lightship taken off station. 1970, August: The lighthouse is automated. The surrounding area: This light is in the middle of the Long Island Sound. Other information: Also known as the Middleground Light, this light can be seen from the Port Jefferson-Bridgeport ferry. 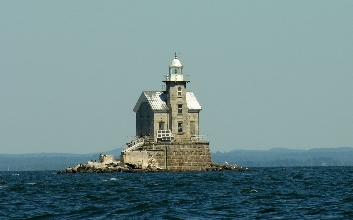 This light's National Register listing mistakenly indicates it is a Connecticut lighthouse. This sort of error is not uncommon for offshore lights near state boarders.